'S e geama ro-innleachd fìor-ùine (RTS) open source 's an-asgaidh a tha sa 0 A.D. a tha ga leasachadh le Wildfire Games, seo buidheann eadar-nàiseanta de leasaichearan geama saor-thoileach. Bidh thu 'nad cheannard aig sìobhaltas àrsaidh 's feumaidh tu stòrasan a chruinneachadh gus feachd a thogail 's na nàimhdean a cheannsachadh. 'S e linn nach robh a-riamh ann a tha san "0 A.D.": Sa mhìosachan àbhaisteach, rachar o 1 R.C. gu 1 A.D, a' leum thairis air a neoni. Riochdaichidh seo an fhaoin-sgeul eachdraidheil sa geama: Cò bhuannaicheadh nan robh na sluaghan a' dèanamh sabaid air àirde an sìobhaltas uile? 0 A.D. (pronounced "zero-ey-dee") is a free, open-source, historical Real Time Strategy (RTS) game currently under development by Wildfire Games, a global group of volunteer game developers. As the leader of an ancient civilization, you must gather the resources you need to raise a military force and dominate your enemies. "0 A.D." is a time period that never actually existed: In the usual calendar, one goes from 1 B.C. to 1 A.D. and skips zero. This reflects the historical fiction in the game: Who would have won if all the factions were pitted against each other when each of them was at its prime? 'S e geama ro-innleachd far an tog thu sìobhaltas a tha ann. Tha e coltach ri Civilisation le Sid Meier ach the a an asgaidh. Rinn mi video à bloighean beaga dhe gheama Freeciv a chluich mi. 'S e geama tachartais 2D air nòs clasaigeach a th' ann am Frogatto is 's e losgann quixotach a th' anns a' phrìomh phearsa. Chaidh a dhèanamh leis an aon sgioba a thug Battle for Wesnoth dhuibh is chaidh ealain phiogsail àrd-ìre a chruthachadh a làimh is le gaol san aon dòigh. 'S e geama "ùrlaran" or "ruith is leum" le sealladh on taobh a th' ann am Frogatto san stiùirich thu am pearsa-tiotail againn air gnothach leamh a thèid na sgiorradh dàna. 'S e geama tòimhseachain/ùrlaran saor a th' ann am Me and My Shadow sa bheil thu a' feuchainn ris an doras a-mach a ruigsinn le fuasgladh thòimhseachan. Feumaidh tu slighe seachad air spìcean, blocaichean a ghluaiseas, blocaichean brisg is mòran a bharrachd a lorg. Clàrach na gluasadan agad is thoir air do sgàile na gluasadan sin ath-dhèanamh ach an ruig thu blocaichean nach ruigeadh tu 'nad aonar. 'S urrainn dhut na leibheilean agad fhèin a chruthachadh cuideachd on a tha deasaiche leibheilean ann. 'S e geama ro-innleachd fìor-ùine (Real Time Strategy Game) a th' ann am Megaglest. 'S urrainn dhut cnàmh-sgeulan no mapaichean air thuaiream a chluiche, agus tha modh ioma-chluicheadair aige. 'S e seirbheis òstadh fhrithealaichean oifigeil a th' ann am Minecraft Realms gus geamannan Minecraft òstadh. 'S e geama a th' ann am Minecraft far an rùraich an cluicheadair mapa innsginneach a tha 'na blocaichean aig a bheil meud dhe meatair ciùbach. A bharrachd air na blocaichean, bheir an àrainneachd lusan, nàimhdean is nithean dhut. Cruinnich stòrasan sa gheama gus a thochladh, sabaid an aghaidh nàimhdean, blocaichean is acainnean ùra a dhèanamh. On a bhios saoghal fosgailte agad, 's urrainn dhut structaran a thogail no obair-ealain a chruthachadh agus iomadh gnìomh eile a dhèanamh air frithealaiche ioma-chluicheadair no 'nad aonar air na mapaichean agad fhèin. 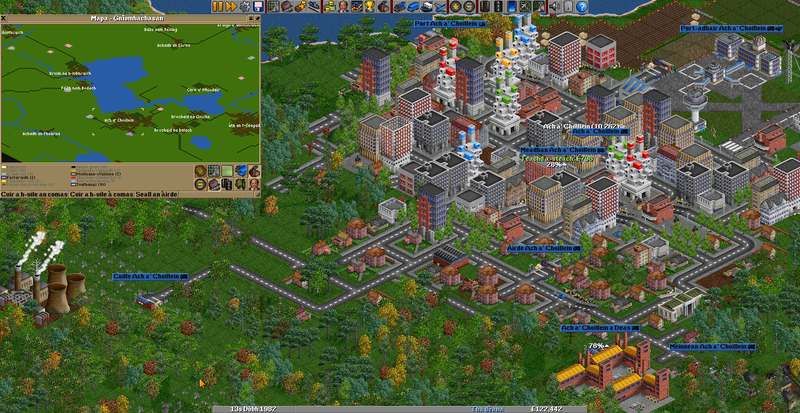 'S e geama saoghail mas-fhìor stèidhichte air Transport Tycoon Deluxe a th' anns an OpenTTD. Togaidh tu lìonra dhe sheirbheisean bus, trèana, luing is plèana. Faodaidh tu cluiche nad aonar no ann an lìonraidh no air loidhne. Tha iomadh tuilleadan ri làimh as urrainn dhut luchdadh a-nuas. Sa gheama thoimhseachain seo, feumaidh tu cinn-fhionn a stiùireadh dhan doras a-mach is iomadh cnap-starra san rathad. Cuiridh tu comasan a leithid leum no togail dhrochaidean dhaibh ach am faigh iad thairis orra gu sàbhailte. Tha an geama seo coltach ri Lemmings ach tha e an-asgaidh. 'S e geama dàna-thuras an fhànais a th' ann am Pioneer a chaidh a shuidheachadh san reul-chrios againne air toiseach an 31mh linn. Chan eil crìoch stèidhichte air a' gheama agus tha iomadh seòrsa beòshlainte ri fhaighinn am measg nan reultan. Bi an toir air cliù agus fortan a' rùrachadh milleanan de rianan-rèile. Rach 'nad eucoireach 's tusa ri spùinneadaireachd, cùiltearachd no sealg tasgail. Stèidhich is bris caidreachasan leis na buidhnean a tha a' sabaid airson cumhachd no saorsa. Tha an domhan na nì thu dheth. 'S e einnsean poker airson Texas Hold'em a th' anns a' PokerTH a gheibhear an-asgaidh. 'S urrainn dhut cluiche 'nad aonar an aghaidh suas gu 9 co-fharpaisichean coimpiutair no le daoine eile air loidhne no air lìonra. Gabhaidh an eadar-aghaidh atharrachadh le gailearaidh dhe stoidhlichean air loidhne. Tha làrach-lìn rangachaidh le clàraidhean nan toraidhean ann. Scrabble sa Ghàidhlig. Cluichibh an aghaidh a' choimpiutair no an aghaidh dhaoine eile. Gaelic Scrabble. Play against the computer or against other players. 'S e geama ro-innleachd fantastachd suidhichte air cuairtean a th' ann am Strì Bheasnaid. Tha modhan cluiche eadar-dhealaichte aige: iomairtean no geamannan ioma-chluicheadair. Faodaidh tu na geamannan ioma-chluicheadair a shuidheachadh cuideachd ach an cluich thu an aghaidh a' choimpiutair. 'S e geama rèise 3D a th' anns an SuperTuxKart. Nì thu rèis ann an cart an aghaidh a' choimpiutair no cluicheadairean ionadail eile. Feumaidh tu an aire a thoirt air an rathad cuideachd far an tog thu nithean air an t-slighe a bhios feumail no a chuireas maille ort. Bheir Widelands modh aon-chluicheadair dhut le iomairtean a dh'innseas sgeulachdan nan treubhan agus an còmhstri ann an saoghal Widelands. Gidheadh, cha tòisich an tuineachadh dha-rìribh mus cluich thu còmhla ri do charaidean air an eadar-lìon no lìonra ionadail gus impireachdan ùra a thogail còmhla - no càch a chèile a cheannsachadh air a' bhlàr. Bheir Widelands inntinn fhuadain dhut cuideachd gus dùbhlan a thoirt ort.